I’m in a unique position in that I have two identical workbenches; my first workbench made from southern yellow pine and my second workbench made from hickory. In this video/article I’ll briefly compare the two. Not a full-blown, in-depth comparison but instead I’ll just hit the high points to cover the most common inquiries I get about comparing the two. 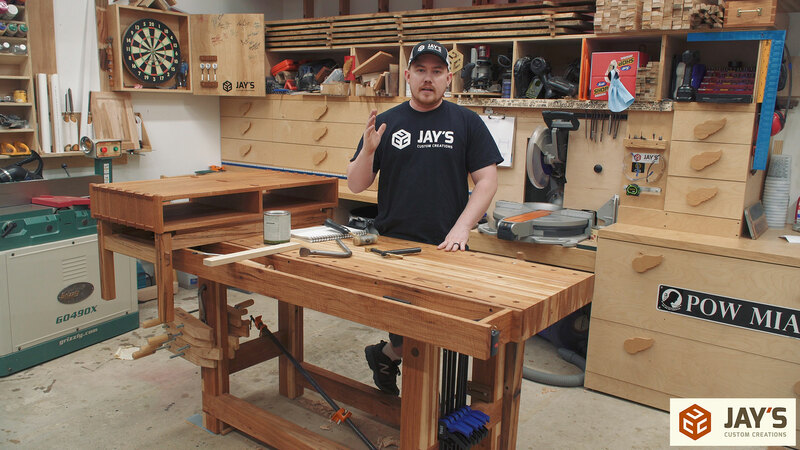 Both workbenches were built with the same laminated material construction for the top and all of the base pieces and they both have the same base joinery and the same base-to-top joinery. The only major difference is that the hickory workbench was built a couple of inches more narrow than the pine workbench due to the materials I had on hand. But with the addition of the tool well on the hickory workbench the total width of the hickory workbench is a couple of inches wider than the pine workbench. I’ll start with the pine workbench. I made the pine workbench over two years ago and have used and abused it since. I know it like the back of my hand. The most common question I get about it is in regards to how the pine is holding up and is it suitable for a workbench. There’s a common misconception that pine is not durable enough for a workbench and also not heavy enough. I think that’s a funny perspective as pine has been used for solid wood flooring for centuries. The pine is holding up just fine and 100% yes, pine is plenty durable and heavy enough for a workbench. How heavy is it? I have no clue and have no desire to find out. That number is irrelevant. There’s enough mass with the pine that it won’t move at all when I don’t want it to move but I’m still able to wiggle it around as needed by myself. Here’s a picture of it shortly after it was built. And here it is today (rotated 180 degrees from the last picture). Pine is definitely fine. Here’s a shot of the hickory workbench (with a project on one end of it with finish drying). It’s somewhat noticeable that all of the thickness dimensions are slightly less on this workbench. Not by much though. 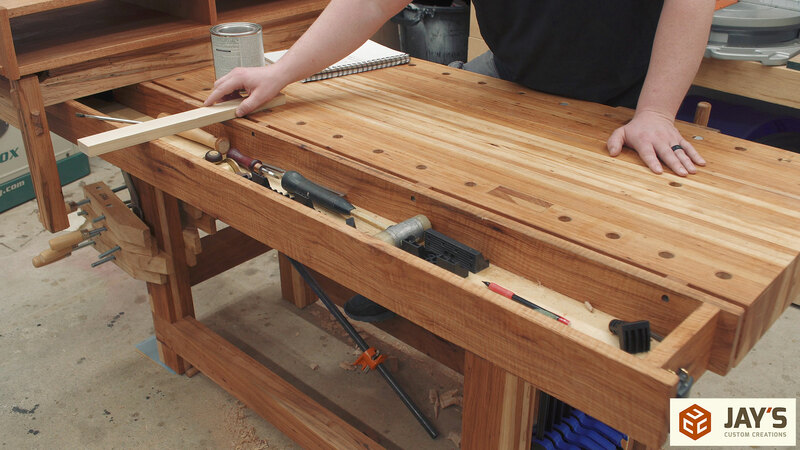 The top thickness on the hickory workbench is 3-5/8” where the pine workbench top thickness is right at 4” thick. Again, identical in design but with the addition of a tool well. So how is the hickory holding up and how does it compare to working on it vs the pine workbench? Hickory is a really hard wood that is commonly used in hammer handles and garden tool handles. It’s chosen for its durability and strength. For that reason it provides a really hard and durable work surface. But I have encountered one downside to the hickory. I’m not sure if it’s a specific property to hickory or all hardwood workbenches but I’ve noticed that after a long period of chisel work on the workbench my chisel hand hurts slightly from the vibration feedback. Similar to hitting a metal baseball bat against a metal pole. There’s definitely a lot more reverb or vibration feedback that I get from the hickory workbench that is non-existent on the pine workbench. That being said, it’s only noticeable after a long chisel session. That’s literally my only complaint about my hickory workbench. On to the leg vises. 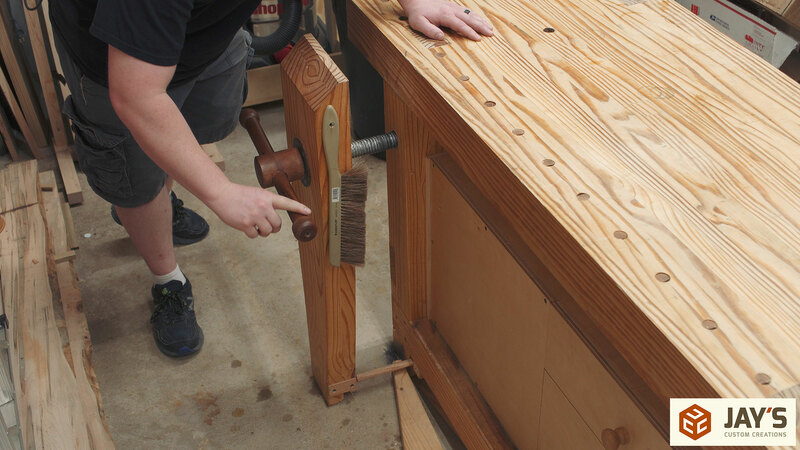 A leg vise is still your least expensive route to get a quality vise on a workbench. My pine workbench has a pine leg vise chop with a wedge style parallel adjustment on the floor. The hardware is a homemade setup with a scaffold leveling leg utilized as the screw and a cherry handle and hub that is pinned to the screw. A large split washer serves as a garter ring to pull the chop back as the screw is retracted. This works great. The pine chop does flex a little bit under heavy pressure but it doesn’t affect its holding ability. On the hickory bench I made the same leg vise out of hickory but used a screw manufactured specifically for a vise or a press. The cost of this screw was about $40 compared to about $20-$25 for the homemade hardware version on the pine workbench. It makes a lot of sense to spend the extra few dollars to get manufactured vise screw and save the time required to make the hub assembly on the scaffold leveling leg option. The only noticeable difference between the two leg vises is that this leg vise chop is made from hickory and therefore has no noticeable flex under use. It’s hard to even consider this an advantage because the pine chop does everything it needs to do. The hickory workbench has a tool well. I’ve quickly become a huge fan of a tool well on a workbench. I put one on this workbench as an afterthought just to experiment to see if I like it. The main complaint against adding one is that it inevitably becomes a clutter catcher. After having one on this workbench for a couple of projects I can confirm that it does indeed become a clutter catcher…and I LOVE it for that very reason. No matter what I’m working on my workbench top will always be a clutter catcher of all the tools and small pieces that I’m using for a particular task or project. My workbenches are only 6′ long which means there isn’t much working surface to begin with. Instead of pushing all of the clutter to the right half of the bench like I normally do I can put items into the tool well and have easy access to them while not interfering with the top surface of my workbench. I always put tools back where they go when I’m done with a project or a major task and always clean the shop by vacuuming everything between projects so the dust and shavings has never been an issue. Lastly, I want to briefly touch on the dog holes and holdfasts. On the pine workbench I have a single row of dog holes close to the main working side of the bench. In each 3/4” hole I have a 3/4” oak dowel that has a negative angle flat face cut on the top to help grab the held material. These dogs have gotten tighter as time has passed. Maybe due to the pine shrinking or the oak expanding as oil is soaked up from above when I oiled the workbench. Regardless, these have been used quite a lot and none of the holes are showing any signs of wearing out. The dogs are tight enough in each hole that I need to use a hammer from below to raise them. I use a Veritas Wonder Dog for clamping between dogs. And each of these holes doubles as a holdfast hole to give me a lot more clamping options. On the hickory workbench I added a second row of holes to the opposite side of the workbench and then a single center hole on each end of the workbench. This gives a LOT of clamping options with holdfasts or with the dogs and Veritas Wonder Dog. I didn’t fill each hole with oak bench dogs though. Instead I bought some metal dogs to see if there was much of a difference. I think the drill bit I used to create the dogs heated up quite a bit and drifted for some of the holes. A few dog holes have a slight bend to them so my 4” brass bench dogs bind too much to be convenient. The solution was to pick up some much less expensive dogs off Amazon that are shorter and have a hole in the bottom. I superglued a smaller dowel in the bottom to act as a handle. This shorter dog length does not bind in the holes and the handle allows me to move them as needed in the thicker top. Side note: These Gramercy Tools holdfasts are an incredible value and work really, really well. Make sure your workbench has enough mass to not move when you don’t want it to move. 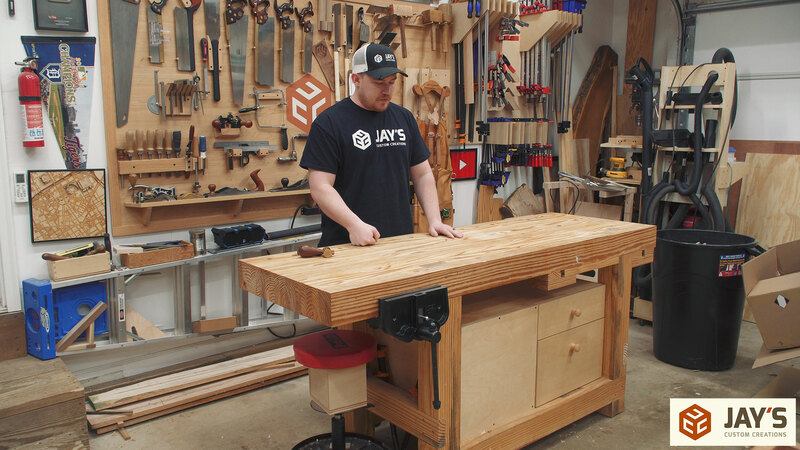 Make sure your workbench design has proper joinery to eliminate racking or wobble back and forth as you are working on it. If you cover those two requirements then the rest of the details are open for interpretation. 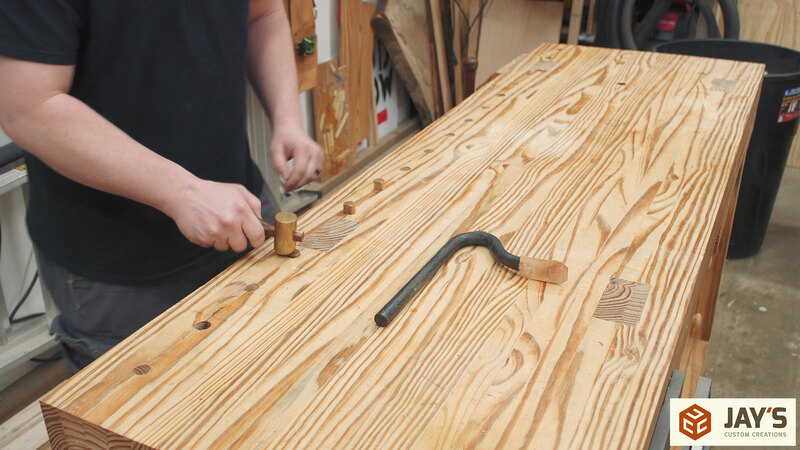 The “best” wood to use for a workbench is the wood you have access to. 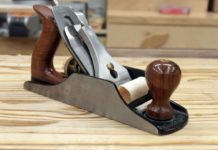 A leg vise is the least expensive route to get a quality vise on a workbench but in its basic form doesn’t offer some of the luxuries of a cast iron vise or other higher-end vise options. If I were to start over in a new shop I would build another workbench identical to my pine workbench, add a tool well, use hardwood for the leg vise chop, and use a dual dog hole setup like my hickory workbench. I enjoyed your comparison of your workbenches. As I told you in a message recently, my workbench is also pine, and I have an Osage orange leg vise. The combination works very will. Also, why would anyone want any option other than the foot-operated wedge on the floor? That is the way to go! I’ve not added dog holes to my bench but may do so soon. And I think I will go with the inexpensive shorter metal dogs that you like, also with a couple of Gramercy holdfasts. Keep up the good work! An informative comparison. I like your “if I had to do it all over” thoughts as I am moving towards a Big Boy workbench. Making a double set of your bunk beds next for the growing cadre of grandkids. Hello Jay — Thank you for your presentation. I truly enjoy listening to your lectures, extremely articulate and fully understandable. Another grateful complement, extremely important, is your voice, very good delivery. Thank you very much for the feedback, Frank. I appreciate it. Jay- Great comparison. I have some thoughts, 1. 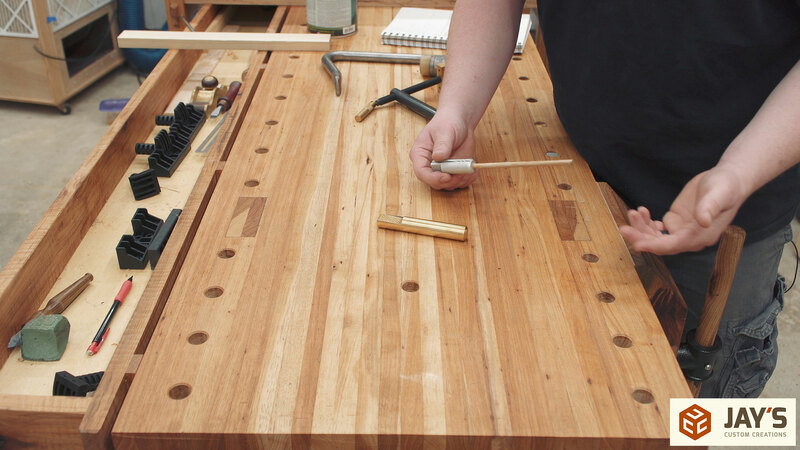 Would you re-size the dog holes to the same width with a spade bit once you have it oiled up? I am planning to build a bench similar to the pine bench (budget issues preclude using more expensive wood) I pl;an on doing an oil finish. Not sure about the cabinet- but I am looking at all options for tool storage. 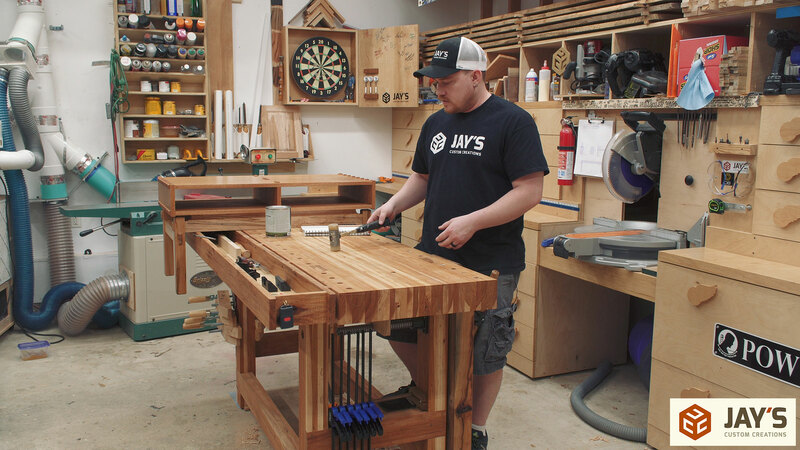 You are an inspiration and one of the best video producers in the woodworking arena. Keep up the great work. 1- I suppose I could do that. But shorter dogs solves that issue. 2- I don’t think the hickory bench would benefit much from extra weight. I think the (minor) issue is the hardness of hickory in general. Great video with lots of ideals to think about. I am chiseling out about 20 mortises on my present project and I was using the top of my table saw because of my workbench was covered with junk and I also notice that my hands started feeling the stress. My workbench top is plywood, but I think you hit the nail on the head with putting tools up and cleaning up between projects. Hey maybe I am not getting old, just falling into bad work habits. Thanks Jay I feel better now, keep up the great work and content. Thanks for the comparison video. I never even thought about the hardness of hickory being a factor in using a chisel. Makes sense though. 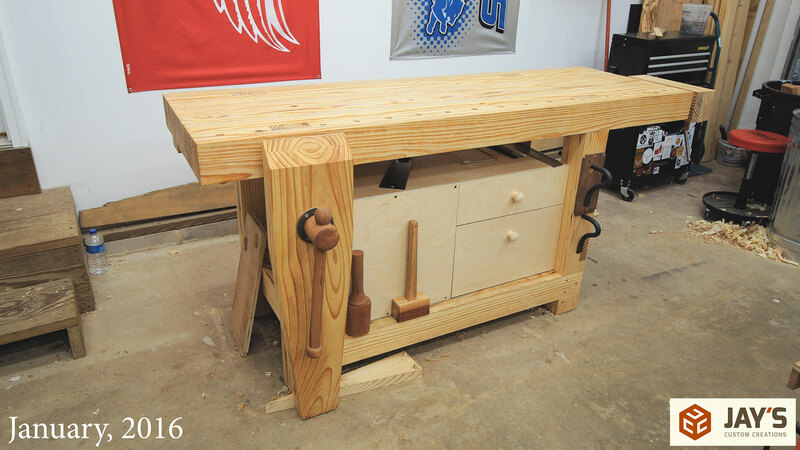 I love the design and will probably use this design in building my workbench, but with the tool well add on. I like the idea of leaving the tools out needed for the next day. Keep up the good work! From my experience your feelings of vibration from the hickory is accurate, I think due to it’s Janka hardness compared to SYP. If you drop a piece of hickory on a concrete floor you’ll hear the difference compared to doing the same with pine or maple. The hickory will almost have a metal sound. I really enjoy your YouTube channel and website. Thanks for all you do. Indeed. Hickory is some tough stuff! Thanks for stopping by, Tom. How much time do you spend hitting a metal bat against a metal pole??! 3.2 hours a day in my youth. I’ve cut back to weekends only due to noise complaints from the community. I’m surprised you didn’t go pro! Thank you for the thoughts about Hickory vs SYP. In my opinion, most SYP should be considered hardwood, at least when compared to white pine. I have never built from hickory, but I think it would be fun to try. Comparing the two very similar benches was a great idea. Thanks again. Love your videos. You are practical and informative. I recently built my “big boy” workbench to replace the Home Depot kit work bench I have been using for years. I made my bench from 100% reclaimed lumber. Houses in our neighborhood were being remodeled, and I scavenged 2×4 s from the curb. 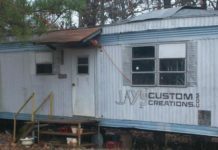 I have a very solid bench with a top laminated from milled reclaimed boards that is three inches thick and has top measurements of about 68″ x 20″ (appx). My total cost is about $27 for some epoxy to fill knot holes and other defects, some glue and a few coats of water based polyurethane. My wife gave me a Yost 9″ vice for Christmas (from my wish list) and I have mounted that. I have not done my dog holes yet, but anticipate doing those soon. I am making dogs from 3/4″ dowels with squares on the top in which I drilled holes with a 3/4″ Forstner bit. It is a very solid bench which does not bounce when pounding and does not move when planing. Very happy with it so far. Yes, it will get beat up, but it will doubtless outlive me. 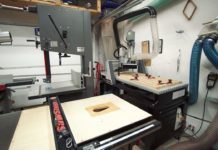 I have also built a miter saw stand with a 3 foot wing on the infeed side and am just finishing a flip top tool cart that I will put my planer on one side, and a drill press and bench grinder on the other. My “shop” is my garage and space is at a premium since we still park two vehicles in the garage. I’m getting into this as I approach retirement and am having a great time with it. Sometimes a bit frustrated, but learning from mistakes. Keep it up. Love learning from you and others. Best. Excellent comparison. As always, you’ve been generous in providing a lot of relevant information not only on the workbenches but also on the accessories. Currently, I use a workbench in plywood and I want to make a wooden one. I mistakenly thought pine was a poor choice, an economic choice in my case, but your arguments about a long chisel session changed my point of view. 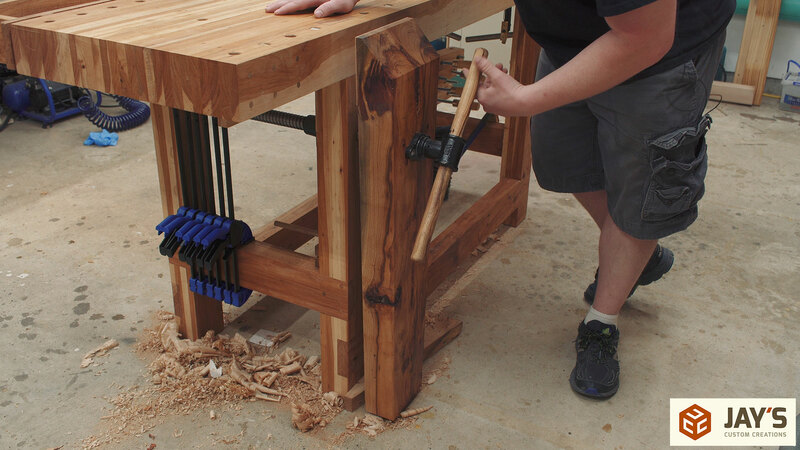 I take note of the advantage of hardwood for leg vise, I will choose this option. Thank you for sharing your experience, it’s helpfull.